"Kid" Elberfeld Redeemed Himself After Making Error. Scrappy Little Third Baseman Made Sensational Catch of Hot Hit Over Third Base and Caught Runner at Horne Plate. 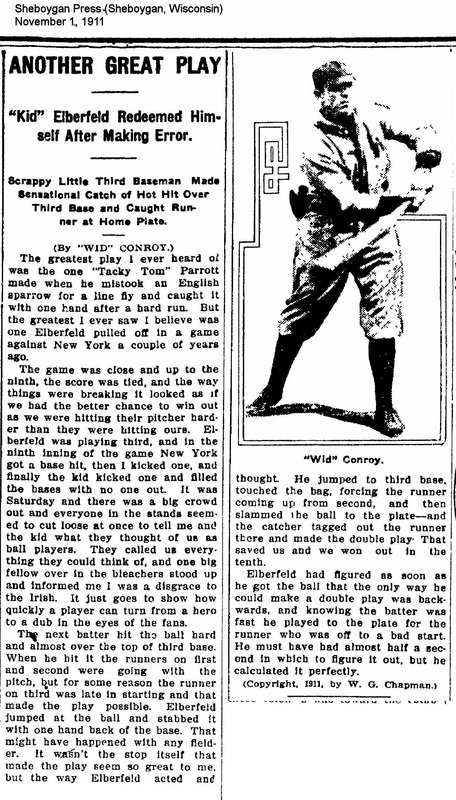 The greatest play I ever heard of was the one "Tacky Tom" Parrott made when he mistook an English sparrow for a line fly and caught it with one hand after a hard run. But the greatest I ever saw I believe was one Elberfeld pulled off in a game against New York a couple of years ago. The game was close and up to the ninth, the score was tied, and the way things were breaking it looked as if we had the better chance to win out as we were hitting their pitcher harder than they were hitting ours. Elberfeld was playing third, and in the ninth inning of the game New York got a base hit, then I kicked one, and finally the Kid kicked one and filled the bases with no one out. It was Saturday and there was a big crowd out and everyone in the stands seemed to cut loose at once to tell me and the Kid what they thought of us as ball players. They called us everything they could think of, and one big fellow over in the bleachers stood up and informed me I was a disgrace to the Irish. It just goes to show how quickly a player can turn from a hero to a dub in the eyes of the fans. The next batter hit the ball hard and almost over the top of third base. When he hit it the runners on first and second were going with the pitch, but for some reason the runner on third was late in starting and that made the play possible. Elberfeld jumped at the ball and stabbed it with one hand back of the base. That might have happened with any fielder. It wasn't the stop itself that made the play seem so great to me. but the way Elberfeld acted and thought. He jumped to third base, touched the bag, forcing the runner coming up from second, and then slammed the ball to the plate—and the catcher tagged out the runner there and made the double play That saved us and we won out in the tenth. Elberfeld had figured as soon as he got the ball that the only way he could make a double play was backwards, and knowing the batter was fast he played to the plate for the runner who was off to a bad start. He must have had almost half a second in which to figure it out, but he calculated it perfectly.